It was not usually in the nature of the Gentle Wind to seek out fighters, but every so often someone was brought to his attention that he felt might be worth traveling for. 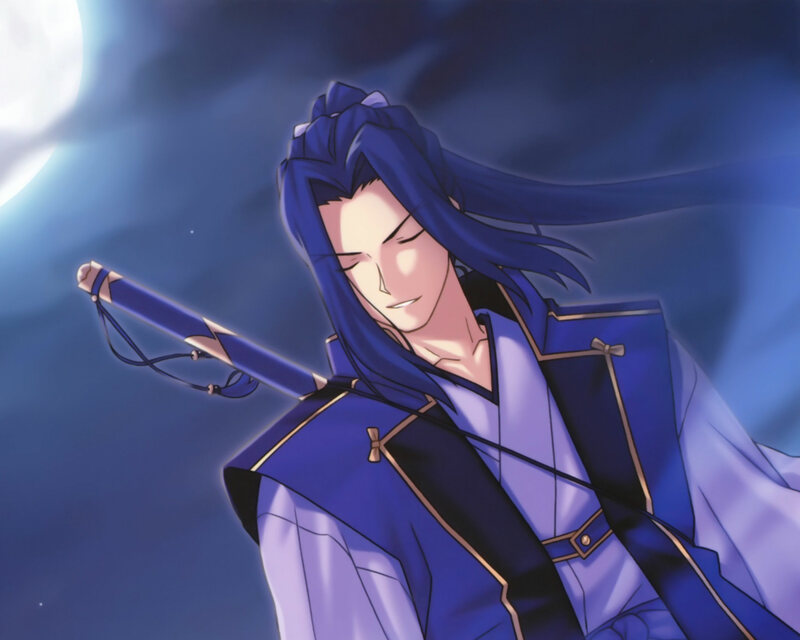 Of course, to his knowledge he had certainly sought out other swordsmen in the past, but seeing as he did not recall being impressed by any of them, he had to assume that it had been more or less a waste of time for him. Today, however, he suspected things would be different. Among the hopefuls who came to his current temple abode to challenge him and train, a few names were spoken among their hopes, be it for the sake of future challenge, sheer awe, or even outright fear. In time, Fuuen had every intention of seeking them all out to examine their styles, but every undertaking began with a single action, and so he sought out the first name he had heard; one Mifune Soan. To most, the sheer search required for this would have been enough to act as a deterrent, but what else did the Plus have to do but seek out fellow swordsmen? This was, frankly, an all too welcome change of pace from his usual days at the temple. Which was not to say he hated his time there, or at any temple for that matter. There was something exceptionally pleasant about spending his days in quiet training, only broken up by the occasional challenger or brief student. But swordsmanship was not a one man study, and a truly beautiful style could only come about through witnessing others. In the end, it was not too terrible a journey. Demon World was not Fuuen's favorite place, and he had to admit a certain distaste for their kind simply on account of his having been forced to kill one of their kind, a thought that still brought a grimace to his face. Nevertheless, he was here for a reason, and as he came across a home that was decidedly not the norm for a demon of this realm, he approached with a calm smile and knocked gently on the door. What sort of artist would he be without propriety? While others may feel it interesting or necessary to seek out legends to challenge, Mifune Soan had long since passed from that phase of his life. There was no blade in the universe he still sought to test his mettle against, no worthy adversary to bring the roar of his soul to life. Settling down with a family had changed his priorities in virtually every way, even with both his wife and daughter now long gone. While it wasn't death he feared, Mifune couldn't justify going out of his way just to hunt down someone to fight. This was perhaps one of the subjects he and his brother disagreed on the most, though arguably it separated him from practically every other Soan as well. The blood in his veins pumped hardest and most hotly when within the fray of war, yet any such urge no longer determined Mifune's actions. He truly was retired. These days the man once renowned as Yojimbo spent his days in seclusion within the confines of his self-built white picket fence house. Standing starkly against the barren background of Demon World's wastes, this building seemed as if transported from 1950's Earth. Yet despite such drastic differences in appearance, there were no attempts from this realm's denizens to change Mifune's house, though for years they had. In the past hardly a day could go by without some foolish demon attacking his property with little but destructive intent in mind. It was Mifune's brutal and immediate responses which eventually led to this string of attacks tapering off until it was known widely not to even near the Soan or his house. Having been a Shadow Fall Banshee certainly helped as well, given the special forces-like squad's infamy as a deadly fighting unit. Though it took a while, Demon World's mooks had finally understood not to mess with the realm's sole human citizen. Mifune had been sitting at his dining room table sipping sake from a small cup when the sound of knocking reached his ears. Having his afternoon interrupted by the call of others seemed to be becoming the norm these days, though at least he never had to rebuild half his home afterwards like what trespassing on his property used to lead to. Mifune stood from his seat, causing the chair to squeak against the room's floor, and made his way to the front of his house. Wanting to make sure he wasn't about to have to kill some random demon again, the man's right eye peaked through his door's peephole where his view was met by....a human? At least, that's what the oddly dressed stranger appeared to be. In truth Mifune couldn't tell the difference between spirits and living beings, having no ability to sense energy or Reiatsu in the slightest. Figuring at the very least the individual didn't seem violent, Mifune groaned and opened the door before addressing his latest visitor. "I don't want whatever you're selling." Well, that was not necessarily the greeting that Fuuen might have hoped for, but he didn't let that deter him. His demeanor stayed entirely pleasant, and he chuckled quietly at the response Mifune gave him. It was...well, definitely something he could work with, he supposed. There was not so much as an ounce of hostility in Fuuen's voice, and his demeanor was completely pleasant. But in spite of his overall behavior, there was most decidedly an air of lighthearted challenge to his words. He very much wished to see what Mifune could do, and while he would certainly leave without seeing anything if that was the ultimate outcome, it was definitely not what he hoped for. To that end, perhaps he did wish to goad the man a tad bit, but if such harmless ribbing was enough to genuinely bother the swordsman, he would be extremely disappointed not in Mifune, but in quite literally everyone who had spoken so highly of him. Mifune listened to the stranger's words without emotion. Neither interest nor disdain would be clear on his face as he stood silently staring at the oddly dressed man standing on his doorstep. Having no way to tell whether this individual was the strongest man alive or little more than an insect in power or skill, the eldest Soan sibling had to rely on his physical senses and his challenger's mannerisms to get an idea. His overly pleasant facade was indicative of either someone genuinely looking for a master he could learn from, or someone so confident in their abilities they merely wanted to "test" Mifune. Either way there was a good chance his house could get severely damaged in the process, which was something he certainly hoped to avoid given how much of a chore repairs would be. Once Fuuen was done speaking his piece, declaring his wish to challenge Mifune and see his skill for his own two eyes, the retired Shadowfall Banshee grimaced and closed his front door in the stranger's face just hard enough to be considered a slam. Pivoting on the spot, he then walked over to the closet beneath the main staircase and from it withdrew a sheath-less katana of impeccable make. This weapon was the only of its kind not usually located in a large container meant to house all of Mifune's other identical swords. After grabbing his weapon of choice, Mifune walked back to the front door and exited his home, something he seemed to be doing more and more as of late. "Get off my property." Assuming Fuuen either already or now moved away from the house, Mifune followed until he stood roughly ten feet away from his challenger safely off his property. Wanting to make clear his intentions, as well as send a few warnings Fuuen's way, Mifune spoke aloud in his smooth but low voice. "Legends never live up to the hype, so whatever expectations you came here with I suggest dropping them now. I'm just a retiree living alone, not some Musashi wannabe who thinks he's the best. The name's Mifune Soan. I'll give you the fight you want, but know this: If you and your blade break, there's no one around to put Humpty Dumpty back together again." Fuuen didn't necessarily appreciate having the door slammed in his face, but he also wasn't entirely sure if that was the end of the conversation, so he decided he would simply wait a moment or two to let that question answer itself. Upon Mifune's return, he was rather pleased to see a sword in his hand, and he of course obliged the request to get away from Mifune's home. He listened carefully to his every word, then drew his sword with his usual serene smile. Taking up his stance, Fuuen stood rather plainly, feet apart, blade held in front of him, no particular form in mind. He was not here to show off, after all. He was silent, simply watching Mifune quite intently, and then forward he moved, a simple strike from below being brought to bear. It was amateur, at least relatively speaking, but that was something of the point. Even a basic swordsman worth his salt could see this coming from a mile away, and he didn't suspect many of the people who came to study under him were capable of discerning that Mifune was even that. Mifune's crimson gaze remained steadily trained on his foreign challenger, taking in information through observation at a pace regular humans could only dream of. Every minute movement Fuuen made was read as they happened, though each new action or tiny change was foretold within Mifune's mind. It was as if he could see the future...though the truth was far more bland than such a thing. Having trained and finely tuned his senses over centuries, Mifune was able to combine his detection and observation skills with his battle experience to create what amounts to basically a near-precognitive ability. Whether it was an opponent's slashes or a gun's bullets firing at him, Mifune could both see and react prior to anyone else. While others used unique abilities to scan opponents for strengths and weaknesses, it was Mifune's honed danger intuition which gave him a leg up against foes of all kinds. And on this day it would once again. As Fuuen's blade moved Mifune did as well, though not with his own sword. Instead, he merely moved his stance and position slightly. First his left foot, and then right, shifted ninety degrees so that his entire body followed and turned right. This deft movement allowed Mifune to dodge the man's attack in its entirety and set him up to respond in the same action. Far quicker than Fuuen had struck out with his sword, the Shadow Fall veteran fired his left hand like a rocket and struck his foe's right side using his index and middle finger knuckles with enough force to dent thick sheet metal and thus knock the air out his lungs. Following up with the same hand, Mifune then placed the tips of his fingers on the other swordsman's upper back and seemingly lightly shoved, though the strength used could potentially push Fuuen forward at least five or more feet if he didn't stumble and fall as well. "Do you not fear death?" With a cough as the knuckles struck his torso, Fuuen kept his footing after Mifune's shove, though he slid away several feet and nearly fell over. Despite himself, he took a moment to catch his breath, and studied Mifune with a bit more interest now. Well, he hadn't exactly expected to be caught quite to that degree, but it did tell him a good bit about this opponent. Excellent. Regaining his bearings, Fuuen once again took up his stance and stood a bit more carefully this time around. He was unsure how to best approach this, both because the opponent was clearly well above his own talents, and simply because this was not yet a genuine fight at this stage. He kept his breathing even, noting he was already in some significant pain from the single strike Mifune had given him. Not ideal at all, was it? Still, it could be worse. Knowing fully that another move like that wouldn't be ideal at all, the Plus much more carefully positioned himself, waiting patiently for what might be another opening. Idly, he considered the fact that there may well not ever be another opening. With that in mind, he took a breath and simply moved forward with a single step, staying on his highest defense both physically and mentally. That, admittedly, was not a particularly great defense, but even so. He already knew that simply attacking would be a poor choice.